As with the heavy favorite for Saturday’s Grade 2, $1 million Louisiana Derby, By My Standards exited a Feb. 16 victory at Fair Grounds. 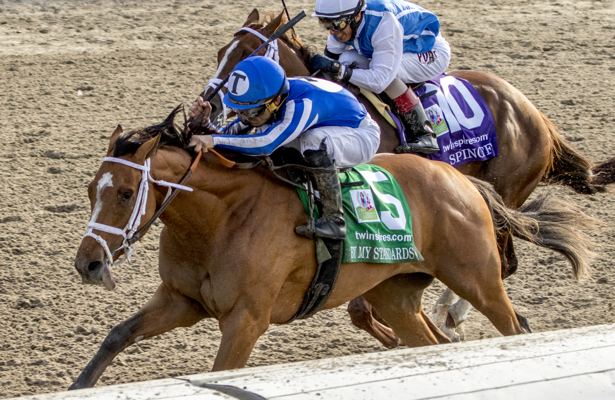 Only War of Will had taken the Risen Star Stakes (G2) to ignite talks of 2019 Kentucky Derby favoritism. By My Standards, meanwhile, exited an eye-catching but under-the-radar maiden special weight victory. Back in the final prep race, the Allied Racing charge went up the rail to out-duel Spinoff and move on to Churchill Downs for trainer Bret Calhoun. “When he was third a couple back, I was shocked — disappointed — that he didn’t put it all together and win,” Calhoun said. “He had a perfect trip that day. He just didn’t finish them off. By My Standards took four tries to break his maiden but more than offset his $150,000 purchase price as a 2-year-old. On Saturday, jockey Gabriel Saez saved ground throughout along the rail, positioning in fourth before hooking out to pass tiring pacesetter Lemniscate, who opened up with fractions of 23.63 and 47.68. From there, By My Standards went on to beat Spinoff by 3/4 of a length, finishing up 1 1/8 miles in 1:49.53. Behind Spinoff, Sueno and Country House filled out the board, with Derby qualifying points paying out on a 100-40-20-10 scale. War of Will, who entered 3-for-3 on dirt, didn’t look his normal self from the start. Off a bit slow, he was caught in traffic throughout the race and missed the board, finishing ninth.